Master/Detail screens are always hard to code for a web UI. They usually include a header record at the top with a list of records below related to the master record. Usually, the top record is more of a traditional form data (the master) where the detailed records are grid-based (the details). The downside with these screens is the maintenance you need to implement on the client-side for a proper model binding to occur on postback. Today, we'll cover a technique to make your master/detail screens a little easier to maintain. For this sample project, we'll use some shopping cart data to explain each approach. There are advantages/disadvantages to this approach. We must create a way to chat with the server when we are finished editing our WebGrid. This could be a SignalR or Web API call to give the user a streamlined experience. I've implemented this approach too many times to count and I'm sure I'm not alone in this endeavor. You create a web grid and serve it up through ASP.NET. if you want to edit a row, click Edit and replace your labels with controls (as shown in my WebGrid series). If you want to delete row, click Delete to remove the row. Again, you are doing everything client-side, but there are issues with this approach. As I mentioned in Top Tips for Model Binding with an array or list, the rows in your WebGrid must meet a certain naming format if you are using form controls. Specifically, the path (or namespace) pertaining to your ViewModel when binding occurs. Let's say you allow users to add or delete a row in their WebGrid. Keep in mind this is client-side. The name and id attribute for those rows won't be in numeric order when model binding occurs on submitting the record. If you add a new row, the row won't have the last row number in your WebGrid. If deleted, you list/array in your WebGrid will lose it's order. When you press submit to save changes, you will need to perform some additional model binding magic to make everything play nicely with your WebGrid rows. Also, if your rows aren't in order or you are missing an element, it will crop the additional elements in the array. As an example, if you had 10 rows in your grid and you delete row 3 and don't renumber your rows, on postback, the model binding will only bind row 1 and 2 to the ViewModel. The remaining rows in your grid (4 through 10) will be lost because of the number gap in the counting. One other possible issue is adding a row on the client-side with a "template" of what the row looks like by creating a hard-coded string. This complicates your code even more. What if we need to add a new column? Where do we add it? In-between the first column? Second? Oh, and don't forget your heading for the new column...oh, and update your colspan columns...ARGHHH! Looking at this hard-coded template, it's hard to determine where to insert it and the human factor could "fat-finger" the tag. There are so many problems with these two issues, it could become a maintenance nightmare. I understand developers find sanctuary in code, but when it comes to passing code to new developers (or devs new to the system), wouldn't it be easier to make modifications to HTML instead of code? With ASP.NET MVC, a partial view would make more sense when creating our detail WebGrid, but how do we update it when adding a new entry? In controllers, partial views act just like any other view, but return partial HTML. All you need to do is perform a "mini-postback" to retrieve your updated WebGrid. For our example, we have an order screen with a customer, Smitty Werbenjagermanjensen, and the products in his shopping cart. 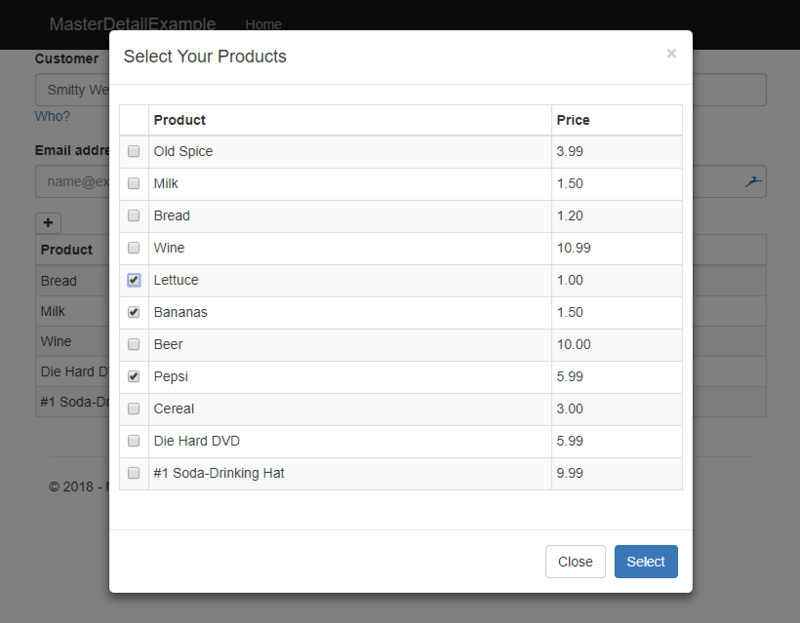 We can add additional products to his shopping cart by clicking the plus symbol at the top of the grid. Let's set up our HTML for this cart. As you can see, it's not much HTML. We need the partial "child-grid" because of it's component nature. This is where the details of your master/detail screen should reside. It's what makes this technique work properly. The "product-dialog" HTML at the bottom is what we'll display when adding new products to Smitty's shopping cart. To display the product dialog box, the show.bs.modal event is necessary so we can prepare the dialog box when it displays the product grid. To dig deeper into this, when the user presses the plus button, Bootstrap uses the data-target in the HTML to "open" the dialog. However, we want some additional functionality with this product dialog. When we "show" the dialog, we want to display a spinner and postback to the HomeController and return a product grid back to us. Once the user selects their products, they click the Select button to add them to their cart. // get the list of selected checkboxes. //  describes each <td> in the row. // Add the selected ids to the map. CustomerId: 1, // Strictly for demo purposes. It may seem like a lot, but as we break it down, it becomes a simple postback with a HTML PartialResult in the end. When the user clicks the Select button, we create an array of existing product id's from the order grid (the initial grid on the screen) and combine them with the selected products in the Product Dialog's grid. The postback data is constructed to look like a ViewModel when posted back to the Partial in the Controller. // Add the Items NOT in the list. // Save the new added items. Even if the user selects the same product already in their cart, it won't add it again. Only new products will be added. 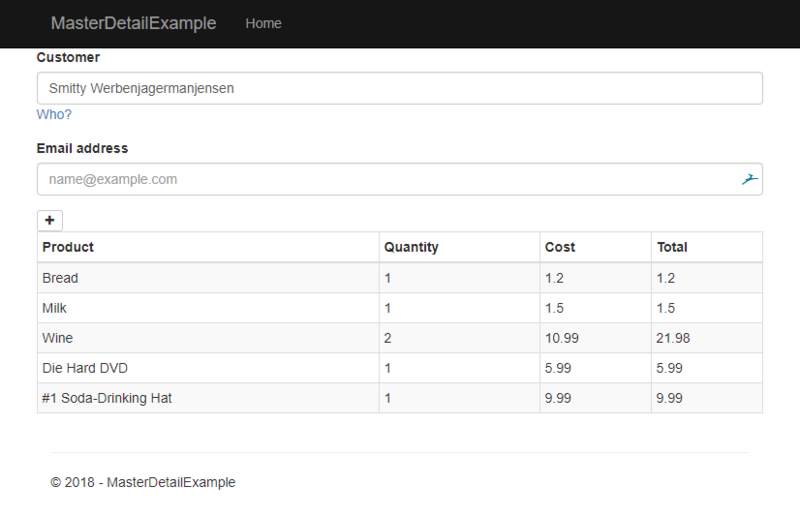 For every Product in their cart, I load the Product object based on the ProductId using the ProductRepository. Where does this make sense? While this is an easier way of manipulating rows with tabular data, it may not work across all applications. The first (and best) scenario for this technique to work is if the detail portion of your screen is simply selecting from a lookup table (like a product list) and adding additional data (like the quantity ordered) because it gives the user an easy way to pick items. Another scenario is entering new data in a row. When adding items to a grid without selecting from a list, have a "Save/Cancel" action at the end of the grid. 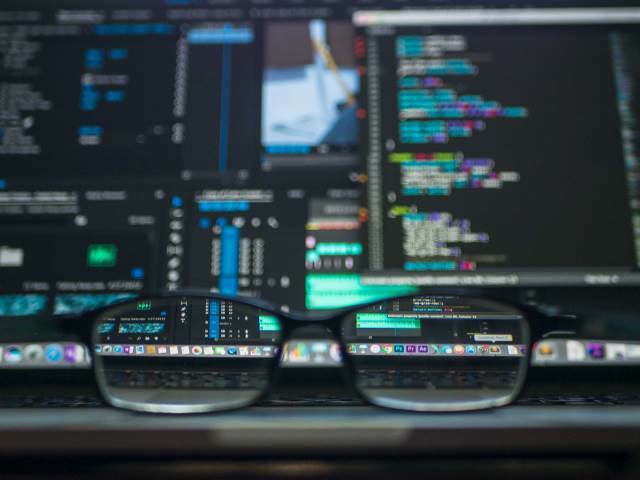 When the user is finished entering data on their row, gather their data and when they press Save, perform the "mini-post" to retrieve the updated WebGrid. Finally, it may seem like a hassle, but having a delete button at the end of a row and clicking it to perform a "Delete" mini-postback to a PartialView Controller would make more sense than clicking the Delete button and using the DOM to remove the row. This approach would mean loss of data (see Issue 1 from above). Sidenote: If you want to see an example of adding rows to a WebGrid using this technique, check out my WebGrid series. How do you implement master/detail screens? Do you create large strings for your grids? Post your comments below and let's discuss.